One day, a hunter named Suswara went hunting to the forest. At nightfall it became very dark so he could not return home. He had to spend the night in the forest. He climbed a bael tree for safety. That night happened to be Shivaratri. Due to hunger and thirst, he could not sleep all night. He wept thinking about his wife and children. He spent the entire night plucking leaves from the bael tree and throwing them on the ground. When it was morning he returned home. Many years passed. At the time of the death, two messengers of Shiva came to take him to heaven. 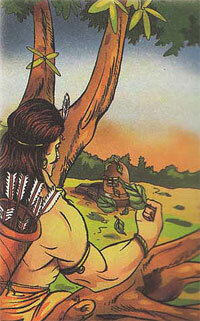 This was because that night of Shivaratri that he had spent in the forest, he had unknowingly worshipped Shiva. There was a Shivalinga under the bael tree that he had climbed up. His tears had washed the Shivalinga and the bael leaves that he had thrown from the tree had fallen on it. He had even fasted all day and all night.